Future food service workers won’t simply be fry cooks or dish washers, they will be problem solvers – equally comfortable in different roles at different businesses. That’s the vision of Jobletics, a Boston-based startup aimed at revolutionizing food service labor. Foodservice has incredible volatility and churn of employees, costing money and time. 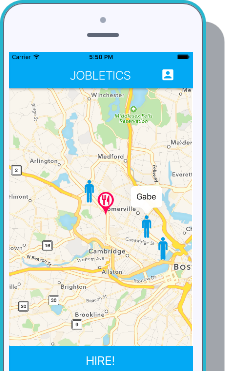 Jobletics’ new platform connects employers with an experienced and adaptable work force, or Jobletes, that provide on-demand labor support. 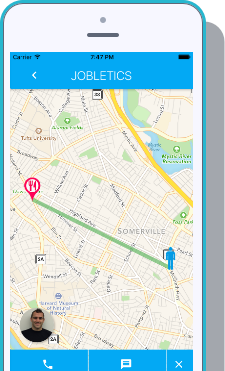 Jobletics’ platform is a simple app that functions like Uber for temp staffing in foodservice. Businesses can request employees on demand and simply specify the type of service needed, from cooking prep to catering help. Jobletics maintains a group of highly qualified employees (the company only accepts 8% of applicants) who can step into whatever role requested. Jobletes are full time employees of Jobletics, and so Jobletics, rather than the customer, carries the full burden of employment costs making it hands-off for the business. Restaurants are facing higher minimum wage rates, compressing already thin retail margins. The elegant solution of transferring a portion of employment cost to a business that specializes in providing qualified, vetted help adds further incentive to use Jobletics’ services. I want it, where can I get it? If you’re a Boston area foodservice business, simply download the app (available in iOS and Android). Are you raising? Yes currently raising for pre-seed round. Revenue: Yes, the service is live and catching fire (during our short interview alone they acquired a new customer). Of note, Jobletics has a 100% customer reuse rate. Market Size: Food service is a $700 billion industry. In 2015 worker shortages cost the industry $64 billion, resulting in 200,000,000 shifts unfilled. Target Customer: Catering outfits and independent restaurants. Will branch out to more food service verticals in time. Cyclicality: Neutral. Food service businesses are exposed to cycles, but will more aggressively pursue cost saving services like Jobletics when revenues are down. Market Shift: According to Bloomberg, for the first time in history (2015), people are spending more on going out to dinner than groceries. Rahul Sharma, Founder, is a Silicon Valley transplant, and came up with the idea for Jobletics after seeing the various failures of industry-specific job boards. His family is in the food services industry, so Rahul had an up close and personal view of the problem he is trying to solve. Gabe, Co-Founder, is an experienced and creative MBA responsible for spearheading business development efforts. Amanda Dupuis is the newest addition to the team. A PHD candidate in Behavioral Psychology at Northeastern, Amanda applies scientific rigor to Jobletics proprietary screening and vetting process. Jobletics is focused on the foodservice industry at this point, where shifts are constantly changing and where labor turnover is most costly. Going forward, the Jobletics platform could be used for any number of retail similar industries, such as brick and mortar retail. Fast food restaurants are rolling out automation procedures, kiosks instead of people, so the workforce of the future needs to be more adaptable and more general. Next stop in the company’s expansion plan is New York City, one of the largest foodservice markets in the U.S.